A rooftop solar system has been installed on the iconic building of St Xavier's High School, Mumbai. 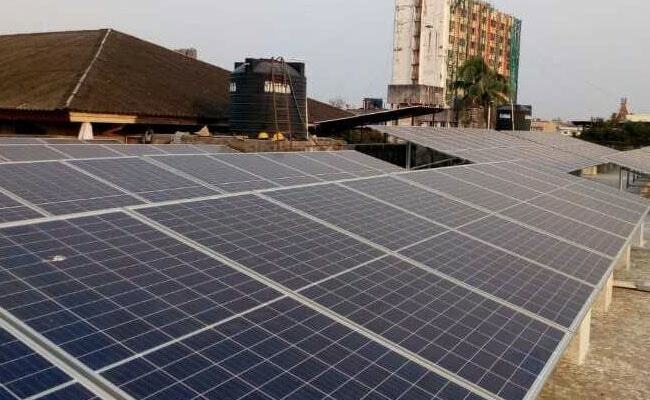 As part of the larger go green initiative taken by the institute as it is celebrating the 150th year anniversary, a rooftop solar system has been installed on the iconic building of St Xavier's High School, Mumbai. The grid-connected rooftop solar plant was inaugurated by Adi Godrej, Chairman of the Godrej Group and Nadir Godrej, Managing Director of Godrej Industries, both alumni of the school. Made up of high-efficiency 350Wp solar panels using the latest half-cut cell technology, the solar system sits beautifully on the roof of the school's iconic building, helping the school save close to Rs 7 lakhs every year on their electricity bill, said a statement from MYSUN, an online rooftop solar platform which provides end-to-end solar solutions. The solar solution is akin to planting 850 trees, it said. Moreover, according to the statement, on the weekends and school holidays, the solar energy generated would be exported back to the grid through net-metering so as to maximise the benefits of solar for the school. The initiative has been hailed by academicians, students and other stakeholders as a welcome move, considering solar energy is the most feasible way to ensure a clean and green environment. "Adopting solar energy will certainly help the school achieve greater economic sustainability by reducing our consumption of and dependence on state supplied electricity," said Father Francis Swamy S.J., Manager of St. Xavier's High School. "Not just saving, the solar system will be an inspiration to our students and teachers who read and study about solar systems as a part of their curriculum. They will be able to see the system up close and we are sure will be the best ambassadors of the go green movement," commented Sharmila Sunny, Principal of the school. Commenting on the initiative, Gagan Vermani, Founder and CEO, MYSUN, said, "This will help the school to address the problems of sustainability while simultaneously saving substantially on power consumption. The prestigious academic institution has set a great example for its students by installing the solar-powered system".